My three-year-old also tends to rip everything my eight-month-old touches out of his hands. “River can’t have this.” And she is so skilled at demanding my constant attention that River often has to entertain himself. 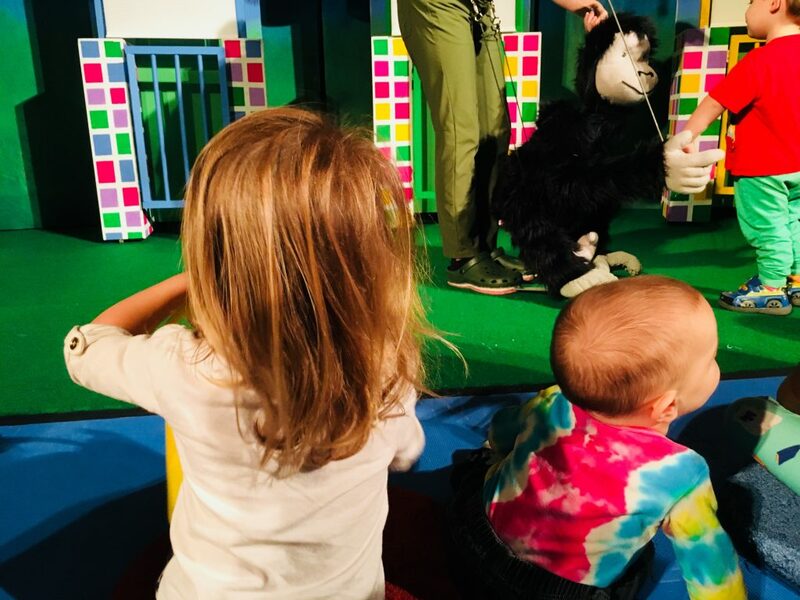 That’s why I was very much looking forward to “Good Night, Gorilla,” the newest musical for babies, from Bay Area Children’s Theatre–in their Theatre for the Very Young series. I knew from experience that BACT would cook up a show that would engage not only my infant on a variety of levels, but my toddler as well. My job would be to sit back and relax. 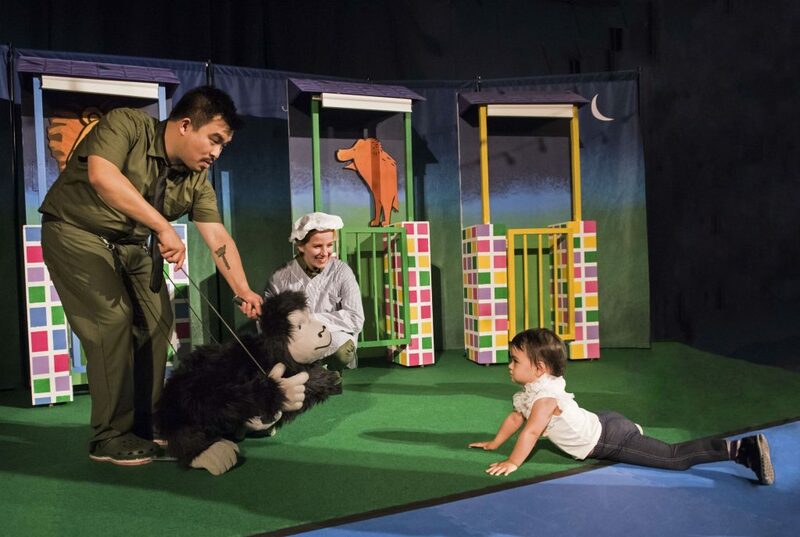 The zookeeper (friendly, warm, funny Phil Wong) invites the children to take a seat on the padded floor, and to meet “Buddy,” the gorilla. Buddy is a large puppet controlled by the other zookeeper, (creative, sweet, engaging Emma Onasch). Buddy is much more than a mere stuffed animal, and many children are enticed to pet his glossy black fur or shake his hand. That’s not all the kids are invited to do. The main zookeeper tells parents that kids are welcome “on stage” pretty much any time, to explore or get a closer look. In fact, audience participation is key to several scenes, and each child is given a bucket to help play a part. In the bucket: a flashlight, a set of keys, and an animal-ear headband. 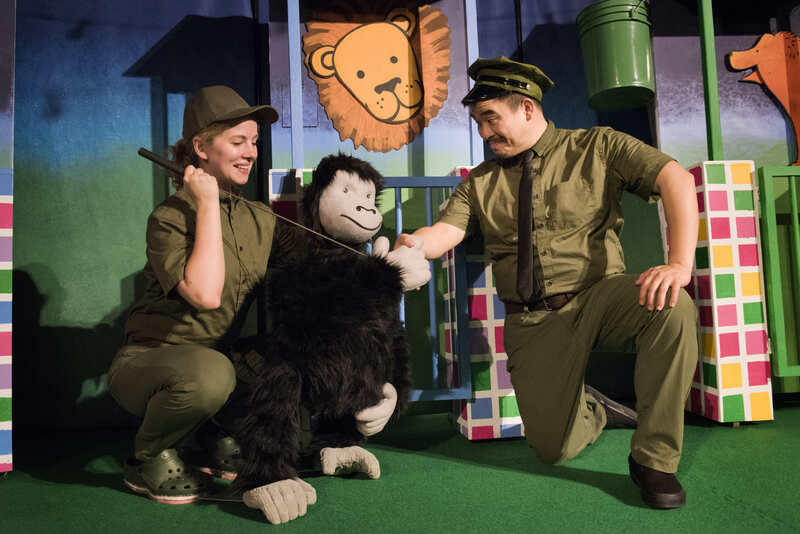 The zookeepers playfully guide the babies and toddlers through the story line—based on the board book by Peggy Rathmann—in-between songs. The light musical touch is perhaps essential to this musical’s success. The songs and dances are just the right length and these wonderful actors create lovely harmonies with ease. At “Good Night Gorilla” the kids become zoo animals, play silly flashlight games, and feel important with their own set of keys. After the zookeeper bids every animal good night with a special limerick, the youngsters watch as Buddy and his mouse friend (rascally Lizzy Asarnow) unlock each cage. It doesn’t matter that many don’t understand what is happening. The bright, interactive set, the crowd’s reaction, and the actors’ antics convey a great deal to the babies. River watched the entire 45-minute show with intense interest, eyes wide, his mouth half open. In a turn that evokes a mood of a storybook turning real, all the kids are invited to follow the zookeeper home, sneaking in the dark just like the animals from the book. A clever set change allows the kids to curl up at the foot of the zookeeper’s bed, for the beloved climax of Rathman’s book. About ten seconds after the show ended, Itasca turned to me and said passionately, “I want to see that gorilla show again!” If River could talk, I’m convinced he would have exclaimed exactly the same thing. Cast: Phil Wong, Emma Onasch, andLizzy Asarnow. Also at Children’s Creativity Museum, San Francisco, from January 26 to March 10, 2019.